NOTE: Sorry this is so late. There were some difficulties getting it up on ACRN; so, I couldn't post it as early as I would have liked. 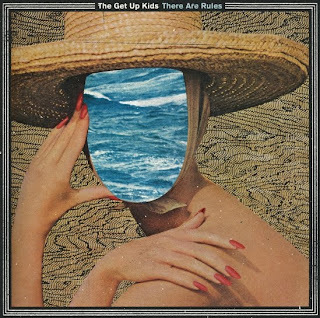 Even if just for nostalgia's sake, The Get Up Kids' There Are Rules is sure to be blasting from many stereos that welcome the changes seven years without a new album can make. UPDATE: January 28, 2011 @ 11:14 a.m. In an interview with Billy Bush, Gerard Way confirmed that Glee will be performing "SING." ORIGINAL POST: January 13, 2011 @ 12:38 p.m.
A dance sequence to an unnamed My Chemical Romance song is set to be featured in an upcoming episode of Glee, according to an article from TV Guide [dot] com that has many My Chemical Romance fans in a mixed-emotions frenzy. According TV Guide, the character Sue "will partake in a dance number set to a My Chemical Romance song," though it gives no further details about which song. "Who cares? Somebody once brought up Glee--like, would that bum me out? I say why get bummed about that? It's like the radio. I don’t watch the show, but I know it would be funny." Yesterday, January 21, 2011, My Chemical Romance performed an intimate, acoustic show at 98.7 F.M. 's Hollywood Tower Penthouse. Luckily for the fans who were unable to witness this first-time event, one of our fellow Killjoys, Irene, was equipped with her camera. Check out her footage of "Helena" ACOUSTIC!! Check out her Youtube page for "Summertime," "I'm Not Okay (I Promise)" and a Q&A from the show in which the band discusses "Drowning Lesson"'s being a "haunted song" and confirm they will be playing Bullets songs on their upcoming tour, among much more! 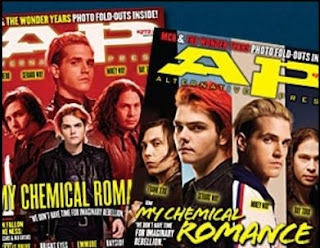 Alternative Press announced yesterday that My Chemical Romance will appear on the cover of their March 2011 issue. The issue, which will be available for purchase February 1, will feature two cover variations and a feature article about MCR. For close to a decade, the New Jersey contingent staked their own claim in America's post-emo landscape, resonating with fans and flummoxing their detractors. Last year, they lost focus, a drummer and their sense of self. This year, they're getting it all back—and more. In addition to featuring MCR on their upcoming cover, AP is also holding a contest for fans to win "a huge prize pack." Two winners will receive: an autographed copy of the issue, limited edition Danger Days... vinyl, various MCR and AP merch and copies of 3 previous issues of AP that feature MCR on the covers. 18 additional winners will receive the autographed issue. My Chemical Romance are set to release vinyl versions of Danger Days: The True Lives of the Fabulous Killjoys on vinyl on February 1. Five-hundred limited edition colored versions of the record will be pressed and available on the MCR online store. A less rare, black version (2,500 will be pressed) will also be made available. Eager fans can preorder the regular edition of their Danger Days... vinyl on Amazon now. UPDATE: January 19, 2011 @ 7:16 p.m. According to a post on the band's website, the 500 colored versions of the vinyl will have a red, white and blue swirl pattern. They will be available through the band's online merch store (linked above) at 11 a.m. on February 1. MCR's Celebrity Playlist Podcast is now available on iTunes. According to a blog post on My Chemical Romance's website, iTunes will launch a My Chemical Romance "Celebrity Podcast" this Tuesday, January 18. The podcast will feature the members of MCR's discussing their favorite music, including Glasvegas, Blur and The Chemical Brothers. Accompanying the launch of the podcast will be a limited-time sale on Danger Days: The True Lives of the Fabulous Killjoys on the U.S. iTunes store. My Chemical Romance have announced the opening acts for their upcoming North American "World Contamination" Tour. My Chemical Romance will appear as musical guests on Conan O'Brien's Conan. The show will air January 17 at 11 p.m. on TBS! 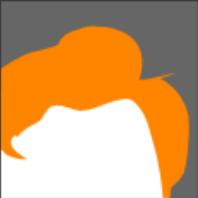 The announcement of the band's Conan appearance follows that of their January 20 appearance on Lopez Tonight, the TBS show that immediately follows Conan on weeknights. Check out the band's performance of "SING" on Conan! My Chemical Romance are set to be the musical guests on the January 20 episode of George Lopez's Lopez Tonight. The performance will air at midnight your local time on TBS. Fans interested in attending the performance can find more information in a recent blog entry on the My Chemical Romance website, which includes a promo code to use when requesting tickets. UPDATE: January 21, 2011 @ 1:31 p.m.